Tiffany is an elegant lighting collection, that transmits elegance to the chosen place.Its sifted light transparences, along with the sparkles of crystal stones make of this lamp a sophisticated and efficient lighting fixture that illuminates while decorating. José Ignacio Ballester created and designed it for Mantra in the search of an ambivalent collection, both for wide spaces and for places in need of an special atmosphere. 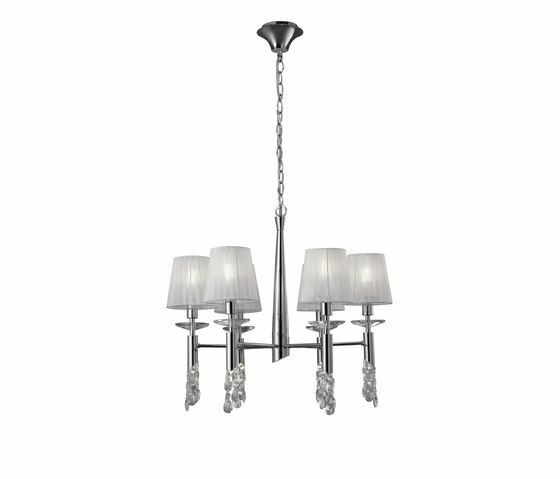 It combines E27 and E14 lights, depending on format,accompanied by inner G9 at the inferior part , a solution that enhances the shines of its crystal carvings, as well as illuminating the surfaces where the light is focused. It comes in different finishings, either chrome with shades in white silk fabric, or old leather with cognac color silk fabric.The collection is presented in different fixtures : linear lamp, floor lamp, wall lamp and table lamp.